Day 4: Momentum building in LA teacher strike | Fight Back! Los Angeles, CA - Citywide, UTLA teachers and parents continue the strong momentum and LAUSD politicians are feeling the pressure. Negotiations have restarted today, January 17. The UTLA strike is getting national attention and the newly elected California Governor Gavin Newsom is calling on LAUSD Superintendent Austin Beutner and LA Mayor Eric Garcetti to continue with negotiations. Newsom is bringing both politicians in to negotiate at LA City Hall. UTLA has the strength and momentum to win for fully-funded, public, community schools. Teachers throughout the city held picket lines with parents and students in unity. In Boyle Heights strong picket lines at Breed Street Elementary started once again as early as 4 a.m. Three contingents, one on Breed Street at the student drop off; one at the other entrance on 3rd Street and Chicago Street where staff parks – but not a single car was there; and the contingent along 4th Street rallied and made a lot of noise. Teachers and Centro CSO hung a large banner on the fence at Breed Street Elementary facing the thousands of passing cars. The banner slogan reads, “Support for public education! No privatization and no mega KIPP Promesa Charter School!” With pouring rain, high winds, but an unwavering spirit, the large group kept the picket line strong. California 53rd Assemblyman Miguel Santiago made an appearance at Breed Street Elementary. Centro CSO members approached him to ask him about his stance on the strike. 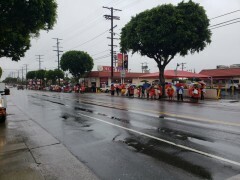 After the morning pickets, all East-Area UTLA members inundated the sidewalks of major streets. A massive sea of red shirts, banners and chants greeted the shouts and honks of support from motorists. In Boyle Heights, strikers and supporters lined the streets for miles, chanting, “Everywhere we go, people wanna know who we are! So we tell em ‘We are the teachers, the mighty mighty teachers! Fighting for justice and for education!’” and “Huelga! Huelga!” (the Spanish word for strike). The future of public education in Los Angeles will depends on the outcome of the UTLA strike. At the monthly Centro CSO meeting, Lupe Torres, who is a UTLA chapter chair and teacher at Marvin Avenue School, gave a strike report. Part of the report included an in-depth talk about the failed model in teaching by KIPP Charter school. Carlos Cerdan, who is also a UTLA chapter chair at Breed Street Elementary, stated that this strike opened his eyes. Picket lines will continue tomorrow Friday, January 18 to complete the first school week of the intense strike. The evening of January 16, UTLA President Alex Caputo-Pearl announced during the daily press conference that UTLA and LAUSD were re-entering negotiations. Centro CSO live-streamed the announcement at their monthly meeting. Plans are to continue picketing in the morning, and joining the massive rally at Grand Park 10:30 a.m., January 18, in downtown Los Angeles, gathering in front of City Hall, and ending each school day with the ongoing picketing. All are encouraged to participate and to join the striking teachers and staff of UTLA.